6 Stunning Celeb Outfits To Inspire Your Sangeet Style! Your bestie’s shaadi is like excitement at an all new level! But deciding what to wear is such a huge task in itself. So this year, as you prepare to swing it and shake it at your BFF’s sangeet, we bring you some much needed inspiration from the glamourous world of Bollywood. Steal these fab styles to cast an everlasting impression! 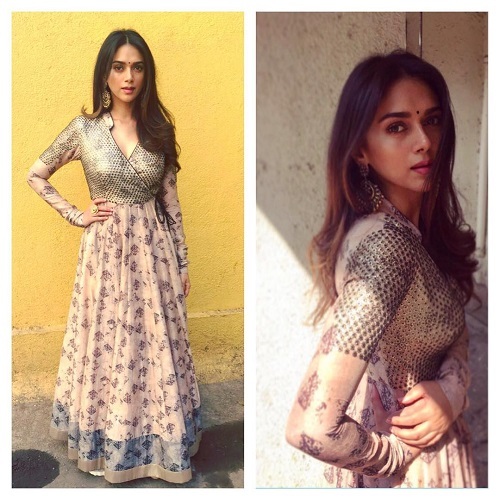 Image: Aditi Rao Hydari on Instagram Now Aditi Rao Hydari sure knows how to look her very best - every time! For a Dilli ki shaadi, she chose a vibrant yellow crop top and skirt set. It’s such a fun fusion lehenga with colourful art and a relaxed silhouette. She styled it with pretty, gold jhumkis, slicked back hair and fresh dewy makeup. Dance all night?! With this look you certainly can! 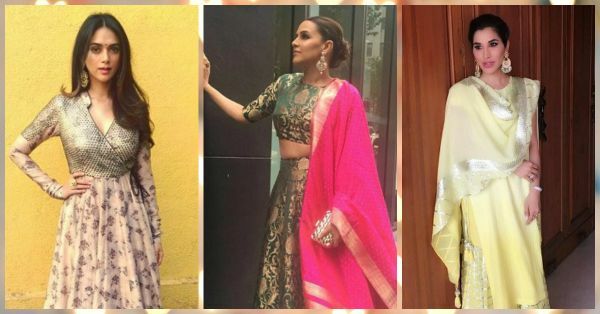 Image: Asli Sona on Instagram Lehenga, saree, anarkali, you’ll be wearing all of these for all the various ceremonies. So why not take a different route at the sangeet?! We love Sonakshi Sinha’s coral off shoulder cape teamed with palazzo pants. It’s young, fresh, flirty and is styled with a pair of statement earrings and a ring. 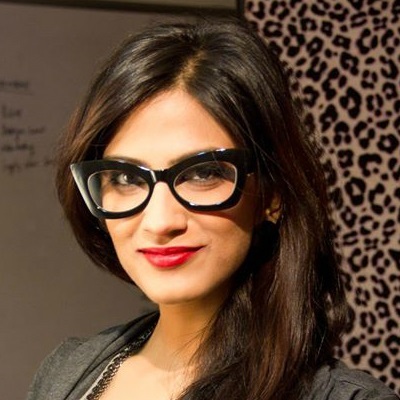 Loose waves, smokey eyes and a peachy lipstick is sure to make you stand out from the rest. Image: Beauty and Fashion Freaks Official on Instagram Just after her wedding, the newlywed Bipasha Basu was spotted in a gorgeous white anarkali by Anita Dongre. A flattering dupatta and the ever favourite gotapatti work is sure to compliment almost everyone. And going by how hot white is this shaadi season, there cannot be a better bet than this for your besties sangeet night. Style it with pretty ethnic earrings and bangles. Image: Sophie Choudry on Instagram Now we all know what a true fashionista Sophie really is and at Bipasha’s mehendi, the singer proved it yet again! Dressed in a subtle yellow sharara, she did cut a very happy picture. We love the silver gota, her oversized earrings and fresh makeup. A sharara like this is such a great bet for the sangeet, but do let those lovely locks flow! Image: Aditi Rao Hydari on Instagram Ok, I am officially in love with this! 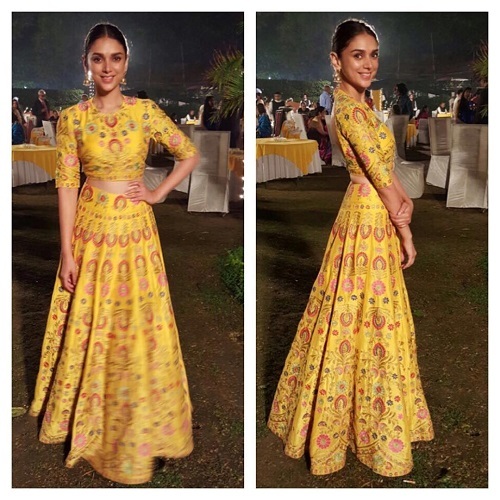 Aditi Rao Hydari slays it yet again in a drop dead gorgeous anarkali style dress. The pretty prints, the subtle colour, the side tie-on, a plunging neckline - it’s all just spot on. And perfect to flatter your figure! This fuss-free look will make sure you keep dancing on! Image: Payal Singhal on Instagram Neha Dhupia cuts a pretty picture in a bottle green brocade lehenga and bright pink dupatta. A truly elegant and royal pick for your bestie’s sangeet, this one’s sure to fetch you a lot of compliments. A neatly tied bun is the perfect hairstyle to uplift the look. HAVE A STORY IDEA FOR POPxo? If you want to hear about it, we can write about it! Just tell us your idea here! MUST-READ: 6 Celebs Who Wore Gorgeous Outfits To Their Family Weddings! MUST-READ: 6 Celebs Who Wore AMAZING Outfits To Their Friends’ Weddings!